It is finally weekend and we got wonderful sunshine here in Belgium. In other words perfect time to have a cup of tea and tell you all what i have been up to yesterday evening. 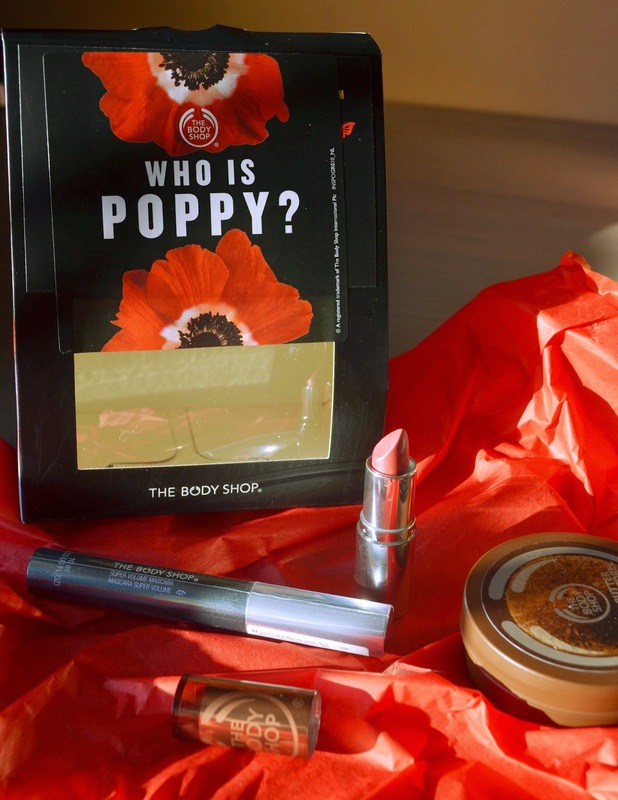 Friday evening after work i went to the release of the new body shop line Smoky Poppy. No, no, i have not suddenly ascended into famous blogger land, this was an event open to all customers for which you could sign up per mail. 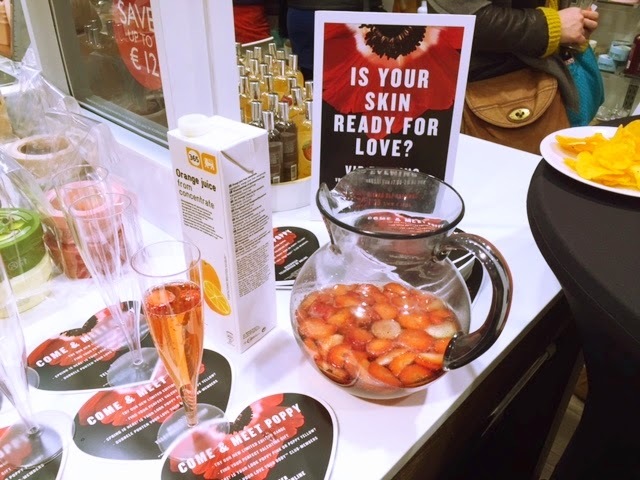 In fact the bodyshop hosts these events several times per year and i think it is such a great idea to build customer relations. It is totally for free and you do not need to buy anything (although i always end up doing so ;) ). The staff in the Leuven Bodyshop is always very friendly but for an event such as this they really pull out all the stops. 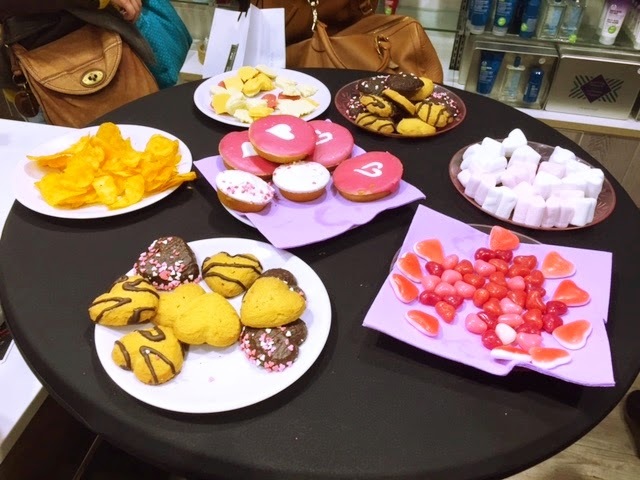 Not only did i get greated with fresh strawberry lemonade and a table of sweet and salty snacks, there was also possibilities to get your make up done with the new smoky poppy make up products, you could opt for a handmassage and obviously you could smell and test all the new products. To top it off, they also gave a 25% discount on their new line and a goodie bag worth 35 euro if you spend 30 euro. I enjoyed it greatly. I even got to talk to some other attendees about my favourite products (found a fellow honeymania lover). So yes, for me a perfect way to end a work week. Obviously i also bought some goodies. Beside stocking up on some favourite and purchasing a few gifts i bought a small gift set of the new smoky poppy line which you can see in the title picture. The scent of this line is for sure a bit more mature and floral. I actually quite like the scent and the packaging is very nice and elegant. I bought just a small size for testing purposes and also because i might have to start soon building a second bathroom, just to stock my beauty products ;). The goodie bag was a nice extra which i did not expect to much from since often such things contain the rests of stock. But boy was i wrong. Not only was the goodie bag really cute, it also contained a gorgeous lipstick from the bodyshops colour crush line. It came in the colour 330 Spice things up which is a beautiful my lips but better shade with an elegant glow to it. I think what i love most about it, is how moisturising it is. It feels nearly like a lip balm but still has a decent colour pay off. 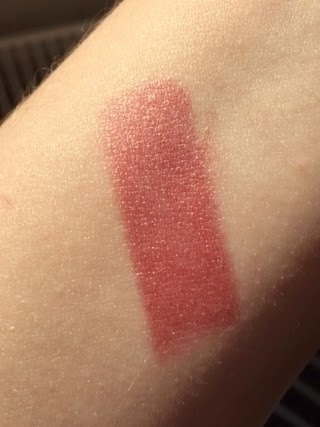 I think it is a perfect daytime lipstick (swatch below). So well done bodyshop for getting me hooked on a new lipstick (i kind of want now more of those). I also recieved a mascara which i have yet to try and a small cocos body butter (can never go wrong with those). It also contained a small envelope with some poppy seeds for the garden. What a cute idea. So well i really enjoyed this small event and can just recommend them. If you are interested, keep your eyes peeled on their website or sign up for their emails. This post is not sponsored. As i said the event was for free and open for all customers. The products were all purchased by me beside the goodie bag which was a special offer. How cool that they did an event like this for the general public! That lipstick looks great. Ye i loved it too. It is nice to still feel valued as a customer compared to the stores which basically make you feel like you have to be grateful to be allowed to buy their stuff. I really liked the scent. It is quite mature and floral as mentioned but it is a really nice touch. Funnily enough i smelled it in the store and did not like the scent but bought a small gift box anyway to give it a real shot. I was happy i did because it smelled so much better at home. I think in shops with a lot of scents, it can happen rather fast that your nose takes up several scents at the same time which do not mix well. I had this happen before at Lush.